This article is about the district Haa. For information about airships, see high-altitude airship. Haa District (Dzongkha: ཧཱ་; Wylie: Haa; alternative spellings include "Ha") is one of the 20 dzongkhag or districts comprising Bhutan. Per the 2015 census, the population of Haa dzongkhag was 13499,1572 households making it the second least populated dzongkhag in Bhutan after Gasa. The dominant language of the district is Dzongkha, the national language. Haa's major feature is the Haa Valley, a steep north-south valley with a narrow floor. The name Haa (pronounced "hah"), as well as the more ancient name Has (Dzongkha: ཧས་; Wylie: Has; pronounced "hay"), connotes esoteric hiddenness. An alternative name for the district is "Hidden-Land Rice Valley." The Haa chhu (river) flows through the valley. The river is stemmed from Mount Jomolhari. The main crops grown in the valley are wheat, barley bitter and sweet buckwheat, although some rice is grown in the lower reaches of the valley. Potatoes, chilis, apples and other cash crops are grown by farmers on the valley floor, along terraced hillsides, and in some of the more accessible side valleys. Per the census, almost every household owns livestock of some type, most commonly yaks and cattle, but also chickens, pig, and horses. 78% of Haa is covered with forest, and forestry plays an important part in local economy. 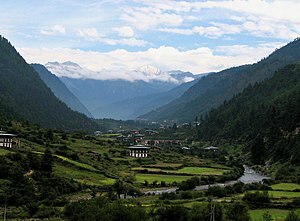 In 2002 the valley was opened to foreign tourism, although its tourist resources remain largely undeveloped compared with Paro, Thimphu, and Bumthang districts/Dzongkhag. Torsa Strict Nature Reserve (shaded pink) has no human inhabitants. Haa District lies along the western border of Bhutan. To the northwest it is bounded by the Tibet. To the southwest it is bounded by Samtse District, to the southeast by Chukha District, and to the northeast by Paro District. Haa contains Torsa Strict Nature Reserve, one of the environmentally protected areas of Bhutan. Torsa contains no human inhabitants other than military patrols and posts, occupying substantial portions of the gewogs of Bji and Sangbay. Torsa is connected to Jigme Dorji National Park via biological corridor, cutting across the northeastern half of Haa District. The Indian Army maintains a military base in the valley to maintain security against incursions from China. The Chinese military has built roads into the Torsa Strict Nature Reserve and Haa District over the past dozen years clearly visible on Google Earth/Maps and other viewing platforms. Local historians maintain that two important temples in Haa District, the Black Temple ( lhakhang Narpo ) and the White Temple ( lhakhang karpo ), were built at the same time as Kichu Temple in Paro in the 7th century AD. The two temples can be found near each other at the sacred site known as Miri Punsum, or "The Three Brother Hills". A third temple, Haa Gonpa, was built further up the valley at the site where a lame pigeon, actually a bodhisattva in disguised form, was found by a local farmer who was drawn to the spot by a mysterious fire seen on several successive nights and by the unexplained sounds of oboes and trumpets (musical instruments closely associated with Bhutanese and Tibetan monasteries). During the 10th day of the 11th month of the Bhutanese calendar (see Tibetan calendar), liturgical ceremonies worshipping Amitabha Buddha are held at Haa Gonpa temple. Near the Black Temple there are two houses near a sacred oak tree where the local deity once appeared as a winged creature, scaring the local people (the valley is divided into a number of areas, each under the influence of a particular local deity predating the arrival of Buddhism — see Bön religion). The residents of the two houses gave offerings to the local deity. The local deity, now appeased, visited the upper house while neglecting the lower. The jealous owner of the lower house began an inter-house feud in which a man of the upper house was killed. Every year 11th lunar month a series of special mystical practices are performed in the upper house for a week. The famous Lam Pema Lingpa also documented the activities of another local deity known as Aup Chungdue. Chungdue was responsible for meteor storms, cyclones, wildfires, rocks splitting apart, earthquakes, and a number of other mystical disasters. The Guru Padmasambhava arrived in the late 8th century and subdued the deity. However the deity's force is not to be taken lightly. In the 15th century aup Chungdue decreed that the people of Ha Shogona village where not to come in contact with any followers of a certain monk in nearby Paro dzongkhag. When a young Haa man married a girl from Paro they believed no harm would come to them. However, as they crossed a river between the two districts the knots tying her infant to her back suddenly came loose and the baby fell into the river and drown. Also near the Black and White temples is a special stupa chorten marking the site where an imprint of Guru Padmasambhava's body and hat may be found in a large rock. In the Samar side-valley may be found a bridge known as Has Samarpudung. Below the bridge is the lake of a wishing cow whose stone udders can be seen in the lake. ^ "Chiwogs in Haa" (PDF). Election Commission, Government of Bhutan. 2011. Archived from the original (PDF) on 2011-10-02. Retrieved 2011-07-28. Tshewang, Lam Pema (2001) History of the Has (Ha) Valley in Journal of Bhutan Studies Volume 5, Winter 2001 p. 50-56. Thimphu: Center for Bhutan Studies. Seeds of Faith: A Comprehensive Guide to the Sacred Places of Bhutan. Vol 1. 2008 KMT Publishers, Thimphu, Bhutan. 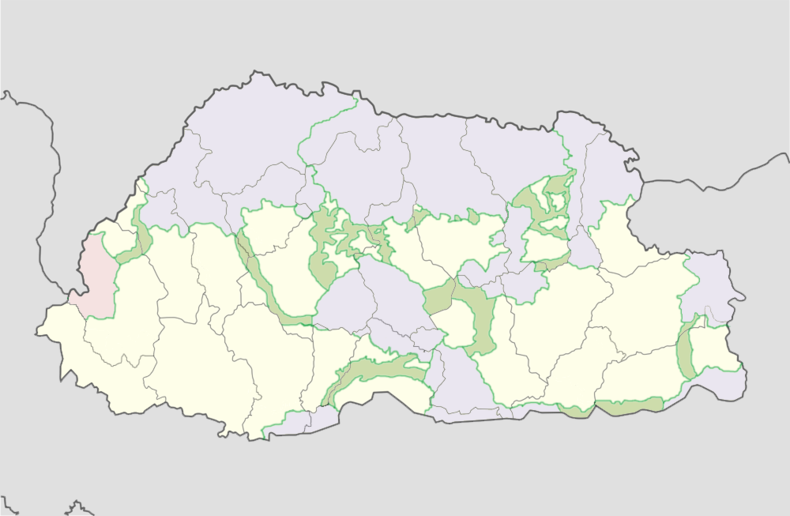 Wikimedia Commons has media related to Haa District. This page was last edited on 29 January 2019, at 12:57 (UTC).